Creating original cocktails from scratch is something that’s always been a challenge for me. Where should I start? What spirit should I use? Often, I find myself stuck. So, on the occasion that I’m struck with inspiration, it’s a great feeling. I got that feeling when sampling ALO last week. 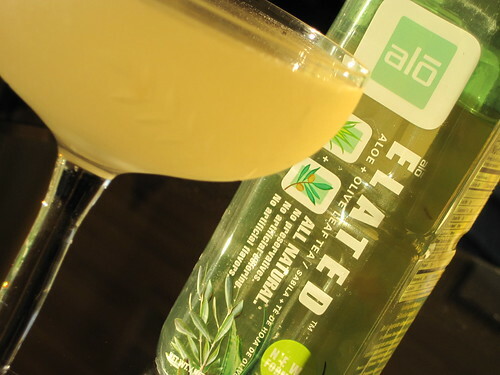 ALO Elated has a nice green tea flavor and that got me thinking what would work well with tea. My first thoughts were of the classic tea garnish, lemon, but what spirit to use. Then I had a moment that can best be described as a mix between an “aha” and “well, duh” moment. Honey. Honey vodka to be specific. I recently sampled, and loved, Spring44 Honey Vodka so that was the natural choice. Enough blather, here’s the recipe. The flavors in this cocktail are not unexpected. Subtle notes of honey and tea run throughout the flavor profile. The lemon comes through as only a bare touch of sourness and lemon flavor. The drink is not overly sweet and yet not dry, just right. The bitters add depth and complexity and a lovely layer of spice. Just what this cocktail needed. I leave the bitters up to you. I used Robert Hess’ House Bitters which were great, the ginger and cardamom flavors play really well with the tea and honey. That said, I think you could use any other aromatic bitter that you like, or even just some orange bitters to play up the citrus. 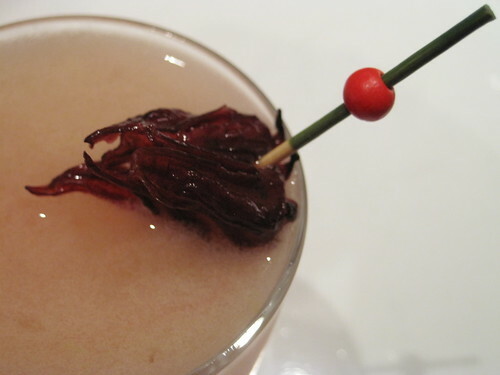 Since this is one of my first forays into creating cocktails from scratch, I have a request. If you mix up this drink, please let me know what you think. That kind of input will help me improve my cocktail improv going forward. I was first exposed to the wonders of Asian markets about 10 years ago. My first experiences were that of awe and excitement. There were tons of new interesting things to look at, buy and, were I brave enough, eat. That last bit brought about a challenge. I offered to my friend Colton that he could pick any drink he could find and I’d, at minimum, try it. I had some seriously weird ones including grass jelly drink and birds nest drink (complete with bits of nest) to name a couple. So when he picked aloe drink it seemed a natural choice, I mean, it has floaty bits in it! So, I have to admit, the floaty bits had me a bit worried. But, after the first taste I was hooked. This stuff is great. Aloe drink has a crisp and fresh flavor with hints of citrus and grape. The floaty bits are pieces of chopped aloe which are rich in vitamins. And, the kicker for me, aloe drink isn’t overly sweet. It only has 120 calories for a 16 oz bottle. So, what started as a sort of dare has turned into a tradition for me. Every time I hit the Asian market I pick up an aloe drink. Thus, it goes without saying that when I was offered samples of ALO, a new aloe drink on the market, I immediately said yes. Though, what really piqued my interest was their suggestions on using it as a cocktail ingredient. Despite the loads of bottles I’ve consumed it never crossed my mind to mix it up in a cocktail. That quickly changed. ALO, unlike the other aloe drinks I’ve had in the past, comes in a variety of flavors. For each they combine aloe pulp and juice with other natural ingredients to make each drink. I had the chance to sample six of their seven flavors. Exposed – Classic Aloe Drink – This is the flavor you’ll recognize if you’ve had any other aloe drinks in the past. The flavor is lightly fruity with a nice citrus hit and a subtle grape flavor. It’s got an interesting fruit characteristic that’s hard to put your finger on. It’s kinda like those fruit candies you get at some restaurants. You know they’re fruit, but you can’t say exactly what fruit. This is a solid base flavor to build off of. Since it’s not overly strong it adds a nice fruity undertone without masking other ingredients. Appeal – Aloe + Pomelo + Pink Grapefruit + Lemon – Very bright and citrusy. The grapefruit flavor is the main player. I think this one could make for an interesting twist on a Paloma or Salty Dog. Elated – Aloe + Olive Leaf Tea – The aloe is subtle in this one with a fresh green tea flavor the star. There is a touch of lemon, but I think it could be bumped up a bit. The tea flavor really piqued my interest and I decided to craft up an original cocktail with it. Look for the Honeysuckle in a few days. In addition, I think this would mix really well with gin. Especially if you found one with tea flavors of its own. Roundhouse, for example. Enrich – Aloe + Pomegranate + Cranberry – The pomegranate and cranberry add a fresh sourness and a bright pink color. I wouldn’t say that either over powers the other, though. Additionally, they’re quite nicely balanced with the aloe flavors. The natural choice for this ALO is a Cosmo. Keep reading for the recipe. Allure – Aloe + Mangosteen + Mango – This was Elisabeth’s hands down favorite. The mango flavor is strong and there is some lychee flavor coming through as well. No particular cocktail immediately springs to mind for this one, but maybe a mango Margarita or something with a solid rum backbone. Awaken – Aloe + Wheatgrass – I’m always a bit leery of wheat grass. It smells like something that came out of a lawn mower. ALO Awaken was a pleasant surpise, then. The grass flavor is subtle and balanced by the fruitiness of the aloe drink base. Subsequent sips found the wheatgrass flavor tamed even further. I tried this in a Caipirinha, thinking to play the grassy flavors off of each other and it was really tasty. Again, the recipe is below. This is a very tasty cocktail. With only 1 tsp of sugar it’s a bit on the dryer side (which I like), but that can certainly be easily tweaked to your personal tastes. As I suspected the grassy notes from the ALO and the cachaca work well with each other. Light, bright and refreshing. Another pink cocktail I could easily drink way too many of. This is another case where the cocktail is actually fairly dry despite having fruit juice and Cointreau in it. If you wanted a bit more sweetness you could add a bit of grenadine which would bump up the pomegranate flavor and add some sweetness. So, to finish, if you haven’t tried aloe drink before you should really give ALO a try. With all their flavors there is a lot to chose from. Plus, they’re distributing ALO in a lot of more mainstream markets, Sunflower, Cost Plus World Market and Whole Foods to name a few. I’ve reviewed Tequila Avion silver some months back and loved it. 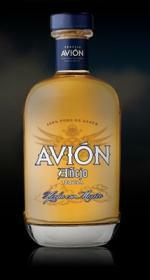 So, when I was given the opportunity to sample Avion‘s anejo bottling I was eager to see how this one stacks up. When I sip an anejo tequila I mentally prepare myself for certain qualities I expect to encounter. I expect some woodiness, vanilla notes from the barrel char, some spice and a decreased agave punch. What I found with Avion anejo didn’t fit neatly in that box and that was a great thing. As you take your first sniffs of the light honey colored spirit you get smooth roasted agave notes, sweetness and fruitiness throughout. The flavor follows suit. Fruity agave is the star, but the aging has mellowed the sharpness leaving you with a tremendously smooth spirit that maintains the character of the agave. The finish is super clean and medium in length leaving you with more of that smooth agave flavor. Since I’ve used the word more than I probably should in this short review, you no doubt realize the character of Avion anejo is agave through and through. You don’t get a ton of vanilla as you do with others, you don’t get heavy woodiness, just clean, pure agave flavor. I really loved this anejo. I will be pouring myself a glass, sipping and hopefully repeating for a very long time.